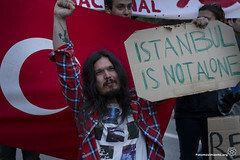 On May Day 2013, the police poured tonnes of tear gas on tens of thousands of workers and youth in different quarters of Istanbul, Turkey in order to stop them from approaching Taksim Square. The government had decided that this square, the traditional venue for May Day celebrations and home to daily political actions big and small, was to be shut to demonstrations this year because development work was being done on a massive scale involving huge excavated pits making it dangerous for crowds. In a ludicrous act, the governor of Istanbul stood atop a mound at the edge of one of those pits to hold a press conference in a desperate attempt to drive home the threat that these pits represented for people.